Chan Kwok Keung attended the show. Alan Tam says that if Eric Tsang showed up he would have seated them together. 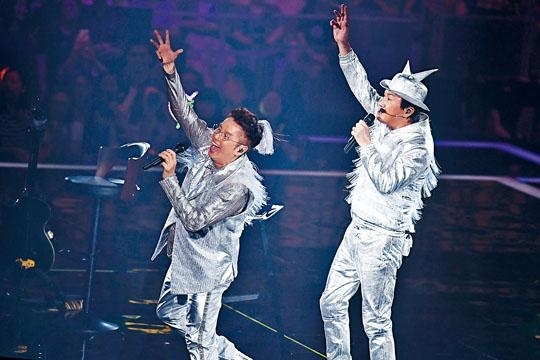 Alan Tam Wing Lun and "God Song" Sam Hui Koon Kit began their 11 show Hong Kong Coliseum concert series. 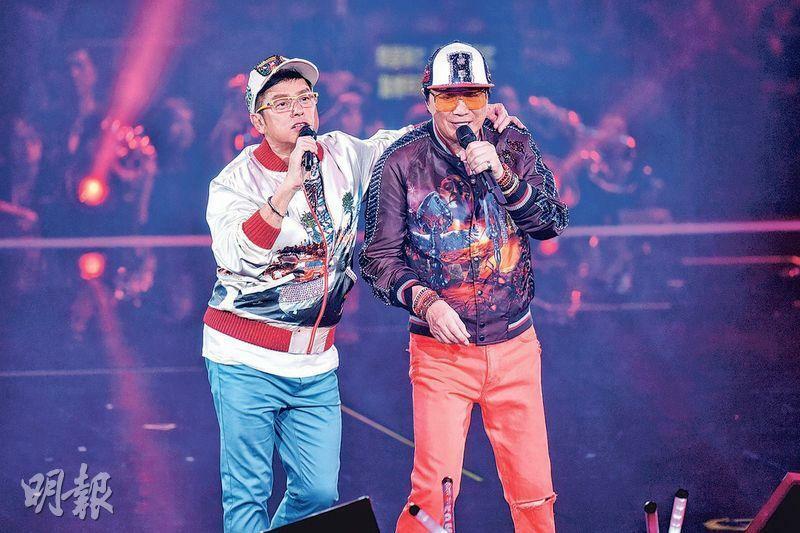 Two master class singers' classic hits were endless as they spared no effort to perform fifty songs for three and a half hours to completely conquer fans. In the end they ended up being "fined" for exceeding over time. Growing up in housing estates, both performed the song CHERISH OF CHERISH to encourage everyone to cherish the lucky land of Hong Kong and demonstrate the unwavering spirit. Showing their support were Michael Hui Koon Man, Deborah Li and her husband. At the opening Alan and Sam put on fake beard and appeared as characters in THE HUI BROTHERS SHOW. 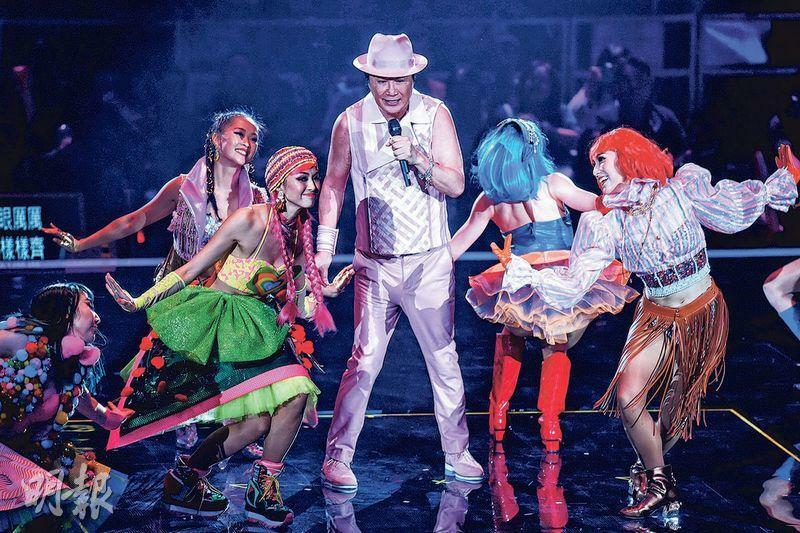 Alan joked, "I was the first one to add a teleprompter at the Hong Kong Coliseum so no one would forget the lyrics. Everyone has to thank me." They hit each other with rubber hammers, then Alan and Sam appeared in silver. After several songs Alan joked, "Let me take off my armor and secret weapon first, with the laser glasses, bib, I shouldn't have let you see me drooling." Alan after removing his hat to show a silver braid in the back of his head. Sam also used a silver guitar to mach. Alan continued to say that last time he waited 40 years to be able to perform with Sam. This time after four season they were able to see everyone again. This time the content was completely different from last time. He also joked that friends in the front row had to be in good health because they would have to sit for several hours without going to the bathroom. Alan's son graduated from Oxford. He said, "Sam's idol is Elvis Presley, mine was the English Elvis (Cliff Richard). He had an Oxford accent, so I have a special connection with Oxford." This time Sam as usual performed his sons Ryan and Scott, then they performed with Alan. Alan praised Ryan for his improved Chinese this year, this time he used all Chinese subtitle. Sam said, "The lyrics are for you, just for you." They both cherished their time with each other. Sam even praised Alan as a handsome man. Sam joked that he has already gradually transitioned. They both grew up in housing estates. Alan said, "Many Hong Kong people are just like us, having witnessed Hong Kong from a no name little island after the war to the struggles of the 60s and the 70s to become a world renowned metropolis. We have to cherish this lucky land of Hong Kong and cherish those around us. Hong Kong people in every business and trade remain unwavering, happy together. They then performed CHERISH OF CHERISH. The entire night they performed almost three and a half hours and ended the show after its time limit. After the show, when as if the boss already expected the overtime fine, Alan joked, "I am the boss. Actually we already talked very little. We have too many songs. The rehearsal is already half a hour more than now. I changed lyrics in one song to thank the fans, which in the end had to be removed. Then I would have to cut one or two songs." Sam's shows before constantly went overtime. Alan said, "We already set bad examples, haha." 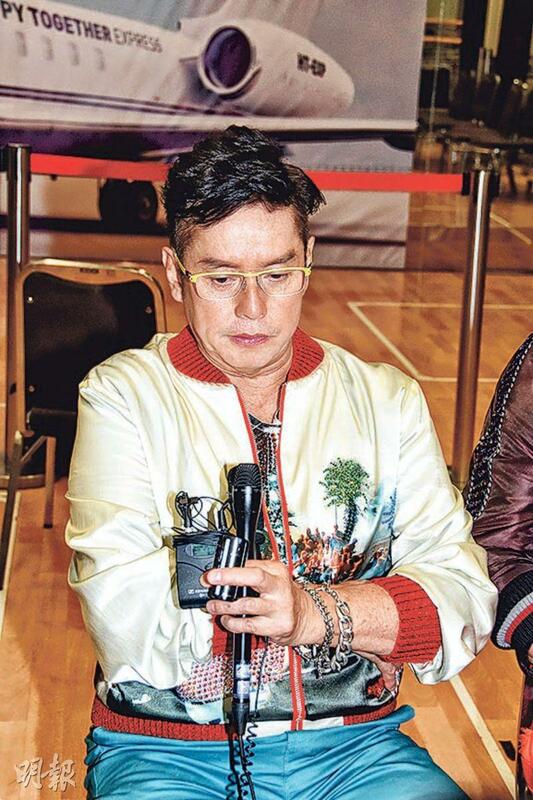 Speaking of Eric Tsang Chi Wai's TVB "ban", Alan said, "He has been very busy lately, so tonight he didn't come. I know he has a big project, he wants to set up shop elsewhere. He met an oil king from India, he is very hard and wants to go international. The first program will be International Super Trio, haha, I am just making stuff up. (Would you be the mediator?) If he came tonight I would sit him next to Chan Kwok Keung, but he didn't. They are fine, I am guessing it's just promotion for Miss Hong Kong. How could they have any problem? (Did you ask Chi Wai?) Usually he volunteers the information to me, maybe he knows I am busy, he hasn't yet." Then he turned around and told the clueless Sam not to worry about the matter of the mortal world.